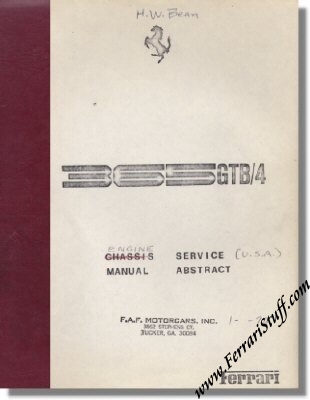 Ferrari 365GTB/4 Daytona Engine Service Manual Abstract (1976?). These manuals were issued by Luigi Chinetti Motors. It comes in a dark red flat binder with transparent cover. It has seen some use and has notes and additions and corrections throughout it. NO Ferrari Print Number but the front page carries the date "1-1976" and comes in a Luigi Chinetti issued binder.